FEEDGRAIN values have crept higher this week, as a fiercely hot and disappointingly dry January to date in most of eastern Australia clips yield from sorghum crops yet to mature, and fuels the likelihood of graziers having to supplementary-feed sheep and cattle into autumn. In addition, Western Australia’s heady early shipment program, has vessels at WA ports having to wait in the line-up before they can load wheat and barley bound for Brisbane and Newcastle. Robinson Grain trader Adam Robinson said the Queensland grain market was pricing itself off import parity from WA in the longer term, but tight supply for nearby had lifted prices. Sources have said eight vessels carrying interstate grain are due to arrive in Brisbane by the end of next month, but none are on the berth at present. While wheat will continue to be the mainstay of feed rations, traders this week said feedlots were now buying sorghum. It remains to be seen whether they will take delivery or use their ownership as a hedge against wheat in the coming months. At a discount to wheat of $90-$100 per tonne, many have seen sorghum as good buying, which has helped to narrow the spread to $80/t this week. Sorghum priced this week at around $350/t farm Darling Downs would for the moment keep it out of the reach of the Chinese consumer, and keep it as an attractive option for atypical users like poultry and pork producers in southern NSW, where wheat is the staple. 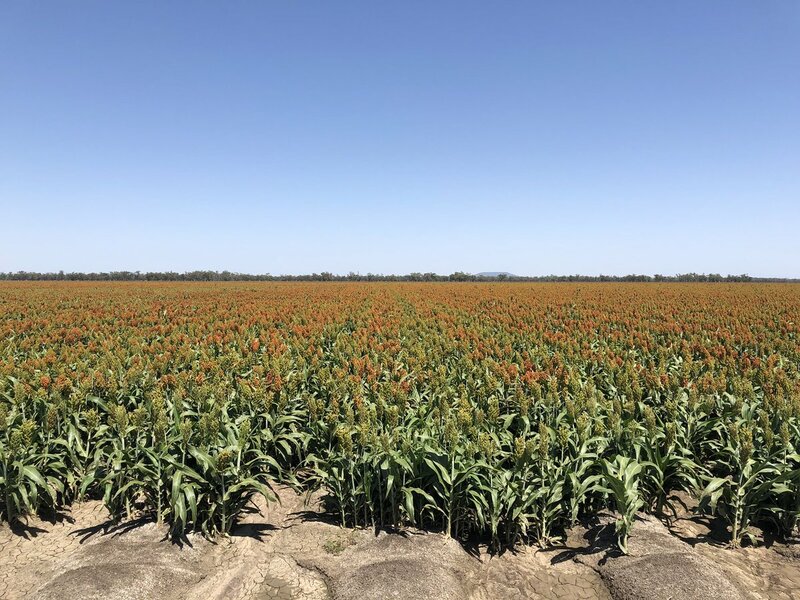 Some good sorghum crops are now being harvested in southern Queensland and western areas, while most crops in northern NSW have started to colour, and will ripen by early February. If the export bid was to lift, sorghum ownership would make its way from domestic to exporters, and be replaced by wheat. Traders generally believe opportunity feedlotters will buy sorghum, but larger operations will stick with WA wheat arriving in Brisbane by ship. AgVantage Commodities broker Josh Brown said the cash market was quiet, apart from some short-covering for near-term which, along with the hot and dry weather, was firming prices. “There’s’ a strangle on grain supply on the Darling Downs now, because people covered for the festive season, and expected grain to be easier to buy now. “It’s that pause in grain coming from WA, and demand creeping up because of what’s happening with sorghum, that has people from the Queensland-NSW border up looking for grain now,” Mr Brown said. Assuming Central Queensland gets the rain it needs to plant in coming weeks, the Queensland/NSW sorghum crop is now seen at around 1.8 million tonnes (Mt), down from at least 2Mt expected prior to Christmas. Traders have quoted feed and ASW wheat for February-March delivery to the Darling Downs at $445-$460/t, and barley at $415/t, while wheat free-on-truck Brisbane is around $435/t. Sorghum delivered Darling Downs is $365/t, Brisbane is trading at $375-$380/t, and Newcastle is $380/t. “That sorghum market is creeping up dollar by dollar and day by day, and barley demand is creeping up too. Some later-planted sorghum crops under stress because of the hot and dry weather are now expected to have light test weights, which would drop them into the Sorghum 2 category at a $20-$25/t discount to top-grade grain. In the protein wheat market, milling wheat has been trading into Narrabri at around $460/t for Prime Hard, and much of it has sold into the seed market. Mr Brown said the harsh season was limiting the pasture growth graziers on the NSW tablelands rely on to create a body of feed to take them into winter, and on the slopes and plains also, the market was starting to look at pasture substitutes like straw and hay. Current-crop cottonseed values received a boost after Christmas, and the nearby market is trading at $150/t above new-crop gin spread. “Hot weather lifted the current crop by $30/t in southern NSW since Christmas as grazier demand kicks in combined with tight stocks,” Woodside Commodities manager Hamish Steele-Park said. Sellers this week were asking $500/t plus ex MIA in southern NSW for January-February. New-crop ginning has commenced in Central Queensland, and has provided a trickle of premium-priced seed awaiting the start of southern Queensland ginning in March. Mr Steele-Park said new-crop cottonseed bids had increased by $10/t since late last year, though the cotton crop did not like the current weather conditions, and sellers were not engaging. A deluge of 100-150 millimetres of rain before Christmas in Victoria’s Western District and southern Wimmera has delayed the end of harvest, which is now winding up in the latest areas. “That knocked around final quality, mainly with regard to falling numbers for wheat and barley, and saw more SFW and GP wheats than we would normally expect,” Riordan Grain Services general manager Mark Lewis said. ASW delivered Melbourne and Geelong has been trading at a steady $430/t, with feed barley at $390-$395/t and malting $405/t.